Recorded 4th August 1947 at the Civic Auditorium, Pasadena, California from the "Just Jazz" Concert. Jacket has a sticker over the top right corner for "Simulated Stereo." Change in title based on cover artwork plus the way it is listed in Goldmine Jazz Album Price Guide. 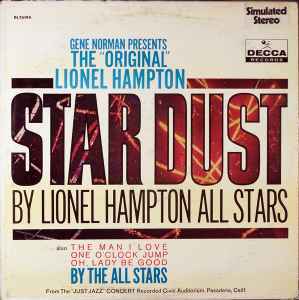 Track 1 titled as The "Original" Star Dust on the center label.